While Tate Modern is gearing itself up to go all artistic, Freudian and cinematic with a master of traditional painting technique, the National Gallery, London, is currently delving into contemporary art with an exhibition of watercolours by Canadian artist Tim Gardner, until 15 April 2007. Judging by this runny impressionistic mess - Couple by a Lake (2006) - the NA should stick with what it knows best. To be fair to Tim, his Skier (click title link) looks better than this example. 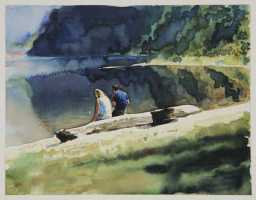 However, England is the home of great watercolour art, and we still have many talented artists working in this medium. In fact we have so many that most of them can't make a living with their art. We don't need to import mediocre artists. Wise up, NA. This is an insult.